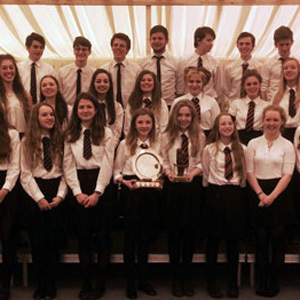 Choral forces from Harrogate Grammar School made quite an impact at the Harrogate Competitive Festival of Music, Speech and Drama last weekend with over 75 students taking part in this prestigious event. The Junior Choir, of over 30 members, came 2nd in the Year 9 and under choral class gaining a Commendation for their singing of the two classics, ‘You raise me up’ and ‘Lean on me’. The ever popular boy’s Barbershop group gained a distinction in their class singing the beautifully evocative ‘Bring Him Home’ from ‘Les Miserables’ and the famous Beach Boys number ‘I get around’. Both songs were met with great cheers from an informed and appreciative audience. Stars of the show though were the HGS Senior Choir who, having gained a Merit for their performances at the Festival last year, gained Honours and first prize in the Year 13 and under Choir category singing two contrasting spirituals, the beautifully arranged ‘Steal Away’ by John Rutter and the ever popular and upbeat ‘This little light of mine’. This choir, fresh from having performed at the National Music for Youth Regional Festival, sang with a pure tone and with great style. Chief adjudicator Stanley Roocroft commented on the choirs’ ‘glorious sound and exemplary technique’. Members of the choir were overjoyed at this success and overwhelmed at the realisation that this victory ensured a place and a ‘sing off’ in the Choral Challenge Class. Hours of rehearsal paid off yet again with joint first place in this competition. Two trophies in quick succession! A great evening for all concerned and a double celebration for these talented singers who have enjoyed well deserved success.